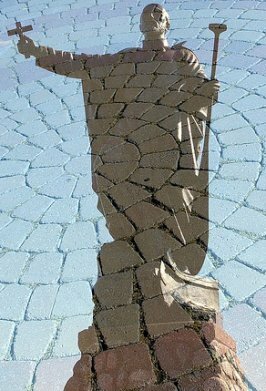 It was on this date that the Jesuit missionary Saint Jean de Brébeuf was martyred by indigenous Iroquois near present-day Midland, Ontario. Brebeuf was of Norman stock, kin to poet Georges de Brebeuf. 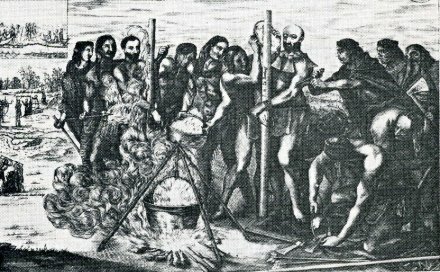 Ordained in 1622, Brebeuf soon decamped to the New World to Christianize the natives. 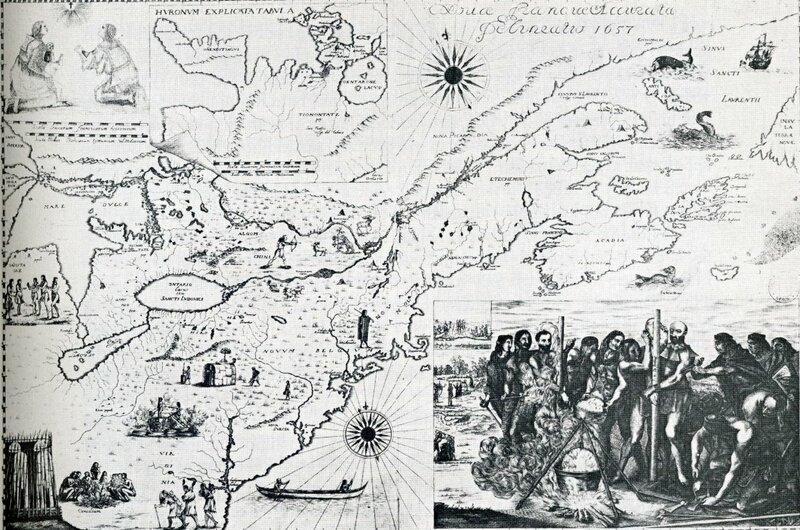 There he teamed up with another Jesuit missionary named Gabriel Lalemant and established the Sainte-Marie among the Hurons mission. As the name advertises, this outpost aimed to minister to the Hurons (Wyandot); to that end, Brebeuf — who learned the local tongue well enough to write a catechism and a dictionary — composed the still-beloved Christmas song “Huron Carol”. Well … not just yet. Brebeuf regrettably foreshadowed his own ghastly fate, for during his ministry, the Huron and Iroquois went to war. No fewer than eight men posted to Brebeuf’s mission were martyred during 1640s Huron-Iroquois wars. As soon as they were taken captive, they were stripped naked, and some of their nails were torn out; and the welcome which they received upon entering the village of St. Ignace was a hailstorm of blows with sticks upon their shoulders, their loins, their legs, their breasts, their bellies, and their faces, — there being no part of their bodies which did not then endure its torment. Some Huron Infidels — former captives of the Iroquois, naturalized among them, and former enemies of the Faith — were irritated by these words, and because our Fathers in their captivity had not their tongues captive. They cut off the hands of one, and pierce the other with sharp awls and iron points; they apply under their armpits and upon their loins hatchets heated red in the fire, and put a necklace of these about their necks in such a way that all the motions of their bodies gave them a new torture. For, if they attempted to lean forward, the red-hot hatchets which hung behind them burned the shoulders everywhere; and if they thought to avoid that pain, bending back a little, their stomachs and breasts experienced a similar torment; if they stood upright, without leaning to one side or the other, these glowing hatchets, touching them alike on all sides, were a double torture to them. They put about them belts of bark, filled with pitch and resin, to which they set fire, which scorched the whole of their bodies. At the height of these torments, Father Gabriel Lallement lifted his eyes to Heaven, clasping his hands from time to time, and uttering sighs to God, whom he invoked to his aid. Father Jean de Brebeuf suffered like a rock, insensible to the fires and the flames, without uttering any cry, and keeping a profound silence, which astonished his executioners themselves: no doubt, his heart was then reposing in his God. Then, returning to himself, he preached to those Infidels, and still more to many good Christian captives, who had compassion on him. Those butchers, indignant at his zeal, in order to hinder him from further speaking of God, girdled his mouth, cut off his nose, and tore off his lips; but his blood spoke much more loudly than his lips had done; and, his heart not being yet torn out, his tongue did not fail to render him service until the last sigh, for blessing God for these torments, and for animating the Christians more vigorously than he had ever done. These were Infidel Hurons, former captives of the Iroquois, and, of old, enemies of the Faith, — who, having previously had sufficient instruction for their salvation, impiously abused it, — in reality, for the glory of the Fathers; but it is much to be feared that it was also for their own misfortune. The more these torments were augmented, the more the Fathers entreated God that their sins should not be the cause of the reprobation of these poor blind ones, whom they pardoned with all their heart. It is surely now that they say in repose, Transivimus per ignem et aquam, et eduxisti nos in refrigerium. When they were fastened to the post where they suffered these torments, and where they were to die, they knelt down, they embraced it with joy, and kissed it piously as the object of their desires and their love, and as a sure and final pledge of their salvation. They were there some time in prayers, and longer than those butchers were willing to permit them. They put out Father Gabriel Lallement’s eyes and applied burning coals in the hollows of the same. Their tortures were not of the same duration. Father Jean de Brebeuf was at the height of his torments at about three o’clock on the same day of the capture, the 16th day of March, and rendered up his soul about four o ‘ clock in the evening. Father Gabriel Lallement endured longer, from six o’clock in the evening until about nine o’clock the next morning, the seventeenth of March. Before their death, both their hearts were torn out, by means of an opening above the breast; and those Barbarians inhumanly feasted thereon, drinking their blood quite warm, which they drew from its source with sacrilegious hands. While still quite full of life, pieces of flesh were removed from their thighs, from the calves of the legs, and from their arms, — which those executioners placed on coals to roast, and ate in their sight. They had slashed their bodies in various parts; and, in order to increase the feeling of pain, they had thrust into these wounds red-hot hatchets. Father Jean de Brebeuf had had the skin which covered his skull torn away; they had cut off his feet and torn the flesh from his thighs, even to the bone, and had split, with the blow of a hatchet, one of his jaws in two. Father Gabriel Lallement had received a hatchet- blow on the left ear, which they had driven into his brain, which appeared exposed; we saw no part of his body, from the feet even to the head, which had not been broiled, and in which he had not been burned alive,—even the eyes, into which those impious ones had thrust burning coals. They had broiled their tongues, repeatedly putting into their mouths flaming brands, and burning pieces of bark, — not willing that they should invoke, in dying, him for whom they were suffering, and who could never die in their hearts. I have learned all this from persons worthy of credence, who have seen it, and reported it to me personally, and who were then captives with them, — but who having been reserved to be put to death at another time, found means to escape. But let us leave these objects of horror, and these monsters of cruelty; since one day all those parts will be endowed with an immortal glory, the greatness of their torments will be the measure of their happiness, and, from now on, they live in the repose of the Saints, and will dwell in it forever. Brebeuf’s intercultural legacy allegedly lives on in sport form. Though it’s unverifiable folklore, it is said that Brebeuf saw Iroquois tribesmen playing the game of baggataway and, reckoning the sticks used to manipulate the ball resembled bishops’ croziers, conferred upon the game the name lacrosse. Europeanized versions of this game (“with a few genteel refinements”) remain wildly popular in Canada, and are growing throughout North America. 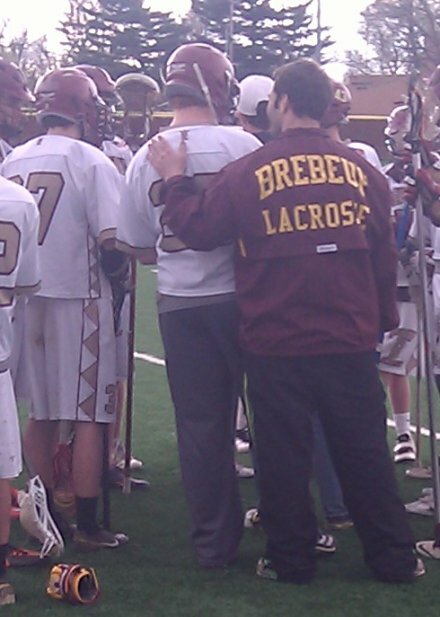 Lax bros can be found especially in the environs of well-heeled private high schools … like Brebeuf Jesuit Prep School (Indianapolis, Indiana). Perhaps I’m just trying to detach myself from the violence described, but one must wonder if these accounts are (piously?) embellished. They describe traumas that would seem to render the victims unconscious (if only from shock), if not dead, far more rapidly than the apparent timelines. Perhaps some this was post-mortem abuse of their corpses? At any rate, it is my fervent hope and prayer, that ALL such torture, for whatever “reason”, based upon whatever belief-system, may be FOREVER relegated to the PAST!